An Alabama gun owner shot by police who mistook him for an active shooter had his back turned when police opened fire, an attorney for the man's family said Monday. During a press conference, Benjamin Crump, lawyer for Emantic "E.J." Bradford, Jr.'s family, showed what he said were diagrams from an independent autopsy report. The images show the points of entry and exit of the shots fired toward Bradford. Crump pointed out that "all three of the gunshot wounds came from the back." Bradford was fatally shot by police on Nov. 22 in Hoover, Alabama. Police were responding at the time to gunfire in the Riverchase Galleria mall, where two others were injured. Crump and Bradford's family want prosecutors to charge the officer involved with homicide, according to NBC News. "There’s nothing that justifies him shooting E.J. as he’s moving away from him. You’re not a threat when you’re running away," Crump said. Emantic Bradford Sr., the victim's father, wished police had given a verbal command before opening fire. "As you see from the evidence, my son was not posing a threat," he said. Police initially reported Bradford had been the shooter before offering a series of corrections, ultimately expressing "regret that our initial media release was not totally accurate." According to eye witnesses, Bradford waved shoppers to safety and drew his firearm in response to the shooting. A witness, recording live in the moments after the shooting, told bystanders that police shot the wrong man. "[They] shot that man down for no reason," he said. Bradford had a lawful permit to carry his concealed firearm, according to Crump. WARNING: Graphic content is discussed in this live video.Attorneys say the private autopsy report shows E.J. 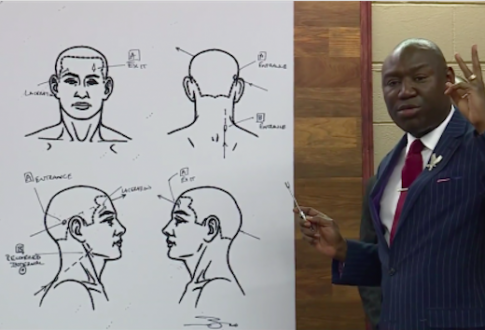 Bradford was shot three times from behind: in his head, neck and near his right hip.Emantic "E.J" Bradford’s family and their attorney Ben Crump held a press conference Monday morning to discuss the findings of a private autopsy. This entry was posted in Issues and tagged 2nd Amendment, Alabama, Police. Bookmark the permalink.